Having recently been asked for a summary of Nathaniel Wallich’s plant collecting expeditions by an Indian researcher, I have compiled the following chronology. Plant material collected by Wallich prior to 1827 is included in the Wallich Catalogue, without attribution of the collector. For other material in the Wallich Catalogue the name of the collector (often abreviated) is given alongside the collecting locality. These are specimens sent to Wallich by British servants of the East India Company, and local plant collectors employed by Wallich. Wallich provides a useful map of his journeys, and those of other collectors, at the back of the third and final volume of Plantae Asiaticae Rariores (1832). Wallich’s first notable collecting trip was to Mauritius, when he was sent to recuperate from malaria in 1812 during his unofficial period with the EIC. There are a few specimens in the Wallich Catalogue before this date, e.g. a handfull of ferns collected in Brazil during his voyage to India. In 1819 Wallich collected near the Nepalese border in Bihar, and in 1820–21 hespent a year in Nepal with the British Resident, Hon. Edward Gardner (1784–1861), accumulating a large collection of living, dried and spirit plant material. In 1822 Wallich travelled with George Potter to Penang, Malacca (Malaysia) and Singapore, again primarily for personal medical reasons, meeting Sir Stamford Raffles (1781–1826). 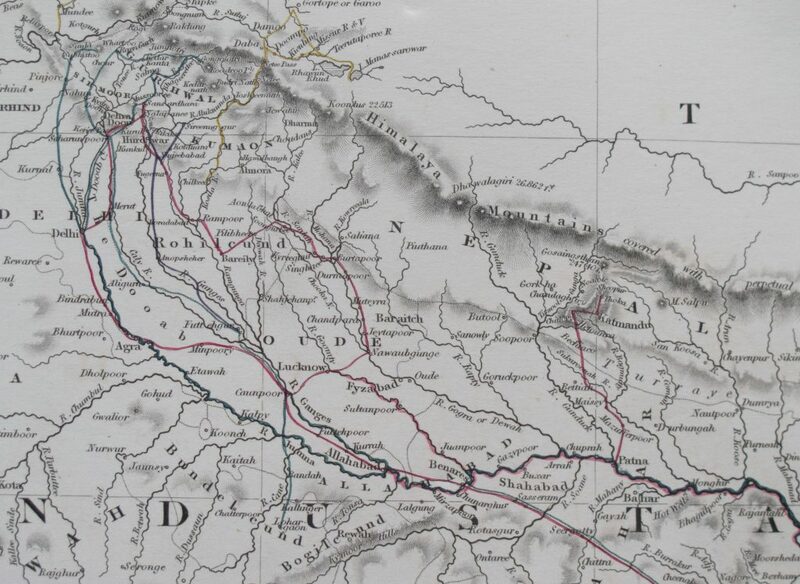 In 1825 Wallich was sent to the Kingdom of Oudh (Awadh, central Uttar Pradesh) and the province of Rohilkhand (NW Uttar Pradesh) to report on sub-montane forests. Finally, in this pre-Wallich Catalogue period of exploration, Wallich was sent on John Crawfurd’s diplomatic mission to the newly ceded areas in Burma (Myanmar) in 1826–1827 to assess the rich timber resources in Martaban and Tenasserim, and also visit the Court of Ava. Wallich was in London from 1827-1832. On his return to India he was mostly involved in activities in Calcutta Botanic Garden and travelled less – at that time he was almost 50 years old, a significant age for a European in India. In 1836 Wallich conducted his tea expedition to Assam with McClelland and Griffith to identify Camellia sinensis var. assamica. Simultaneously he developed an interest in the flora of the Nilgiris and was in contact with John Sullivan and others, but did not visit that area. When recuperating in South Africa from mid 1842 – 1844, he visited the Cederberg area and Eastern Cape. I am indebted to Martin Krieger for his help with this article. Martin’s scholarly biography of the great man Nathaniel Wallich: Ein Botaniker zwischen Kopenhagen und Kalkutta (Wachholtz Murmann Publishers, 2017) is highly recommended. The main Wallich Catalogue project homepage gives background information on the Wallich Catalogue, and links to further explainatory pages as they are written. I wonder if a kickstarter book through say Isola Press could be created to bring togther these wonderful stories?